Learning how to take creatine is vital for getting the best results you can. After all, if you're going to the trouble of buying and taking it, you want to get the most bang for your buck and time. These simple guidelines will walk you through the right way to take creatine during your loading phase and how to take creatine for maintenance. 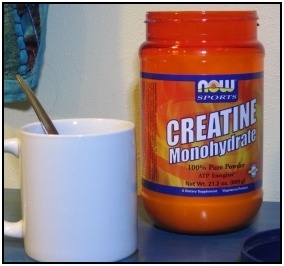 When you first start taking creatine you need to saturate your muscles with it. This means taking a much higher dosage than normal for the first few days. For the first 5 days that you take creatine, take 0.3 g of it per. kilogram of your of body weight. This is the right amount to saturate your muscles so that you can start experiencing gains as fast as possible. A 135 pound (61.2 kg) woman would take 18.4 grams of creatine per day during her loading phase. A 220 pound (99.8 kg) guy would take 29.9 grams of creatine per day during his loading phase. And How Much After That For Maintenance? 'Maintenance' is all subsequent days that you want to get the benefits of creatine. After your loading phase, you don't need as much to keep your muscles full. For your maintenance phase, take just 0.03 g of creatine per kilogram of body weight. That's all - just a tenth of what you were taking. A 135 pound (61.2 kg) woman would take 1.8 grams of creatine a day for maintenance. A 220 pound (99.8 kg) guy would take 3.0 grams of creatine a day for maintenance. How Should I Take The Creatine? During your loading phase, break your creatine supplement into 4 dosages throughout the day. This will be easier to take, rather than having 25-ish grams of creatine all at once, and give your body a chance to absorb it over the whole day. For maintenance, take your few grams once a day. It's simple and you don't need to think a lot about it. Most creatine supplements are powdered. Mix the powder into water, tea, a milkshake, etc. to take it. Keep taking creatine as long as you're working out and want the benefits. There are very few adverse effects, and it will keep helping you. The only studies regarding long term creatine use center on athletes who have taken it as part of their training for more than 4 years. The side effects from taking creatine appear to be passing more 'gas' than normal and having slight gastronomical upset; these effects also manifest sometimes during the loading phase. So, you're got very little to lose. When you stop taking creatine, your muscles will gradually drop back to their normal creatine saturation level. It usually takes about 4 weeks for your creatine levels to drop. Now that you know how to take creatine the right way, be sure to use it in your training. It gives you tons of benefits, and is really easy to do. • Click here to leave 'How to Take Creatine To Get Results Fast' & go back to the Home-page! 1. Baechle, Thomas R., and Roger W. Earle. 2008. Essentials of Strength Training and Conditioning. Champaign, Ill: Human Kinetics. Pp. 196. 3. Benardot, Dan, and Dan Benardot. 2006. Advanced Sports Nutrition. Champaign, IL: Human Kinetics. Pp. 108.